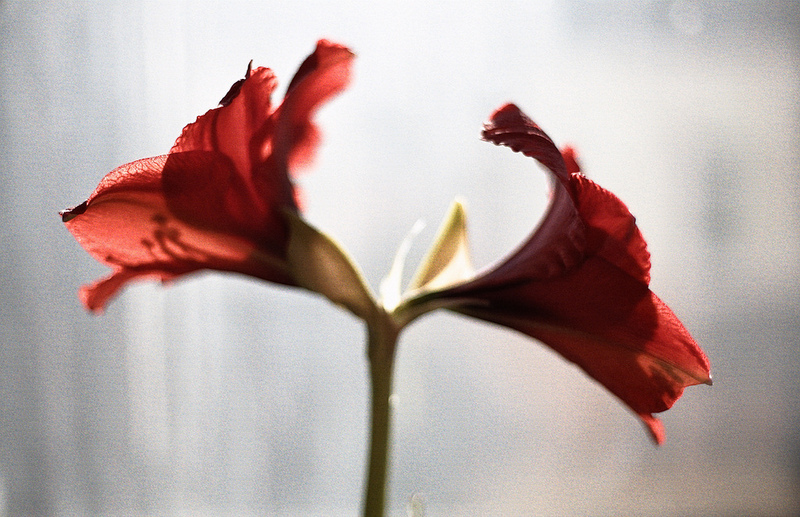 First day of the new year and already I succumb to the impulse to try and preserve what to me is a perfect example of beauty – this amaryllis. It just seems to be exploding with joy this new day on our window sill. It’s a cliche of / about beauty for sure – who can argue against the inherent beauty of a flower in full bloom, but then too, why let that stop the impulse? But, photography is a quick sketch — very different process than drawing – considering light, lens, subject, color and having a sense of what the machine can do – all of this is very much of and about the “world out there” that you and I both have the opportunity to see and touch – though I know that we all see it in a bit different way… there is enough in common that we can relate. That’s one aspect of what I think is so great about photography. This entry was posted in Personal Photo Notes and tagged brief, Photography by Matt Niebuhr - West Branch Studio. Bookmark the permalink.